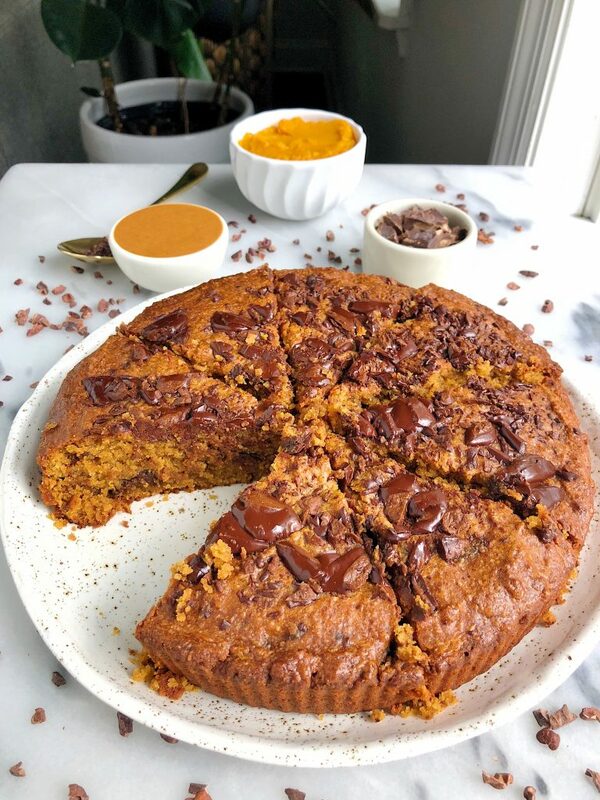 Paleo Pumpkin Chocolate Chunk Cookie Cake made with gluten-free ingredients for a naturally sweetened, dreamy pumpkin cookie recipe! It is pumpkin season. So that means you are either hyped up and eating all things fall and pumpkin spiced OR you cringe at the thought of anything pumpkin (like Jord). 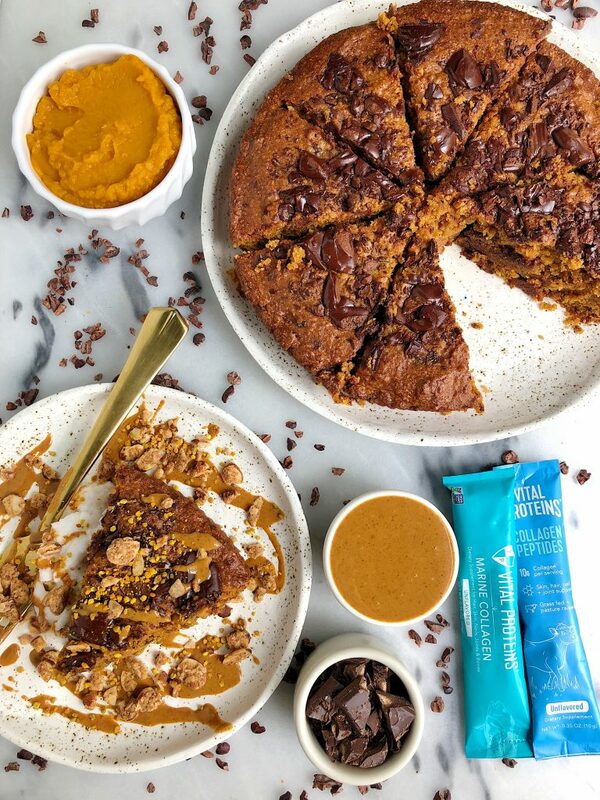 This Paleo Pumpkin Chocolate Chunk Cookie Cake though is perfect for the pumpkin lovers or the haters. I gave a slice to Jordan and he had no clue there was even pumpkin in it! It adds just the right creamy and moist consistency but the flavor isn’t overwhelming at all. Plus whenever you add chocolate to something, it tends to overpower most of the other flavors, ya know? I had my Dad try this recipe too and he said it is one of his favorites from the blog ever. Massive compliment coming from the traditional dessert king who doesn’t usually fancy the healthier alternatives. I love that this Paleo Pumpkin Chocolate Chunk Cookie Cake is a crowd pleaser for everyone. It is gluten-free, grain-free, dairy-free and has no refined sugar in it. I use a mix of organic unsweetened pumpkin (make sure you get unsweetened, it is such a waste of sugar if not! ), creamy almond butter and coconut oil for the wet ingredients. You can use flax egg or pasture raised eggs, so feel free to make this recipe plant-based if needed. I also use almond flour and a mix of Vital Proteins Collagen Peptides for the dry ingredients. I love using both of these ingredients in my recipes because you get some extra healthy fats from the almond flour and protein from the collagen peptides. Plus since I started using collagen peptide a few years ago, my hair has grown tremendously and it helps with digestion, joint health and adds extra protein to anything (more on that here). I use Vital Proteins and their many varieties of collagen they offer. The best part is you don’t even taste it. It also dissolves right into anything and doesn’t work as a thickener. If you guys make this recipe, don’t forget to share with me on social media! I love love love seeing what you guys bake at home and it also helps inspire what new recipes to test for you soon. Here are a few of my other go-to recipes with Vital Proteins: 4-ingredient Blueberry Collagen Jam, Easy Collagen Breakfast Crepes and Sweet Potato Brownies. Thank you Vital Proteins for sponsoring this post! It means so much to me to work with brands I love and believe in! Looks so good! Wondering if I can sub the coconut sugar with a sugar-free alternative like monk fruit? i don’t usually bake with monk fruit so i can’t say! but this does need the grainy-texture of coconut sugar in my opinion! Looks amazing! 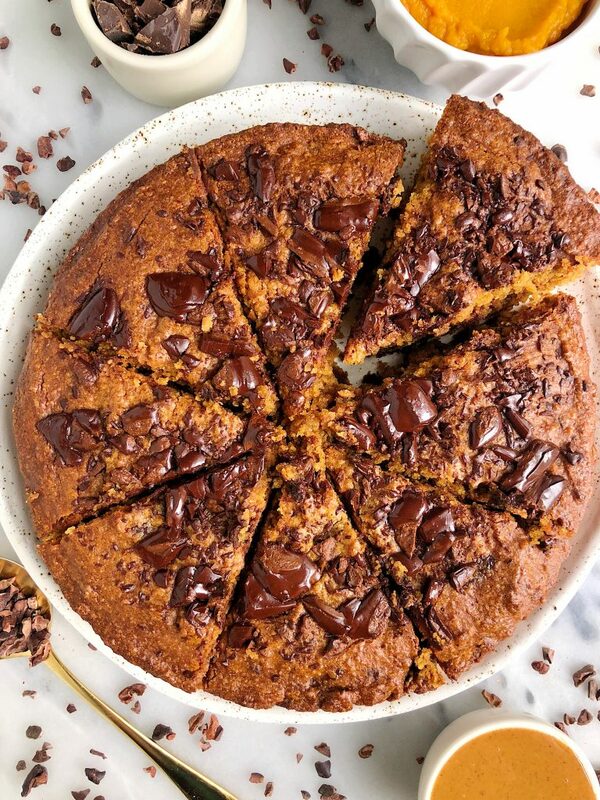 Combines my two favorite things, pumpkin and chocolate 😋 could you use a cast iron skillet if you don’t have a baking round or would a square baking dish work better? Have you ever tried to to half the recipie? I would love to make it but I dont know that I would eat that much of it! Looks amazing! Could I bake this in a loaf pan? no i don’t think so. a skillet or 8×8 baking dish is best. loaf pan is too narrow. I saw you post this a few days ago and it looked so great, immediately pinned it! I got laid off at the end of last week from my design job unexpectidly and I remembered reading an article about how the same circumstance spurred your wonderful brand, so I figured today was a great day to make it! And it’s so tasty and was the perfect hour for me to clear my head and then enjoy some good fall pumpkin cake. Thanks for the continued tasty and heathy recipes! awwww sending you love boo!! How do you think it would be to sub flax for collagen? collagen doesn’t need a sub but you can add more flax if you’d like! Hi I’m new to trying healthy dessert Recipes. I’m confused on the coconut sugar I noticed there’s a few different kinds brown,golden and palm . What one is correct? Made this last night for my daughters birthday. So good. I did change the flours a bit. I did 2 c. almond and 1 c. coconut flour. Turned out great. I also used monkfruit sugar because I was out of coconut sugar.